Location: Some other world, likely cracking open a cold one with the boys. Did you accidentally switch auto dash and double tap dash? I have double tap turned on and I run immediately upon pressing a direction, and was having issues with it turned off. EDIT: Green Hill Zone's song is labled as Green Hill Zone (Brawl), which is just the genesis song, but that's not what I hear... I don't get it. Speaking of which, are there supposed to be multiple songs per stage? I've only ever heard one. I noticed that too, likely a mislabeled original comp. In the event of a potato-related emergency, jump out the nearest window. - Crateria platform doesn't move. Samus' Fully Charge-Shot does 10%+ it's suppose to (doing 37% instead of 27%). And if you are about 3/4 charged already, than immediately try to buffer a Charge before landing; Samus will enter ground charging and be stuck in it forever, until hit. Luigi Movement, Cancel, Tech, etc. ". . . Emphasis . . . of players helping one-another"
Goku Kamehameha resets when he lands if you hold it. Meta Knight Down Air won't have landing animation; will in fact produce a second D-Air on the ground if quick enough. Last edited by BrineBlade on Tue May 30, 2017 2:04 am, edited 1 time in total. Location: Somewhere low on the tier list. Currently Playing: Dem Mind Games. I am having multiple issues, all extremely frustrating. Issue #1- The framerate dips down when there are 3-4 fighters on the screen for me. It's to the point that I cannot fight properly. My PC has an I5, and a GTX 960. I can run Witcher 3 on 1080p Ultra. It's not my PC for sure. Issue #2- When I put the graphics on maximum, the game's screen doesn't appear to fit on my monitors screen, causing weird graphical bugs and such. Overall, AMAZING GAME !!! Just these issues for now. 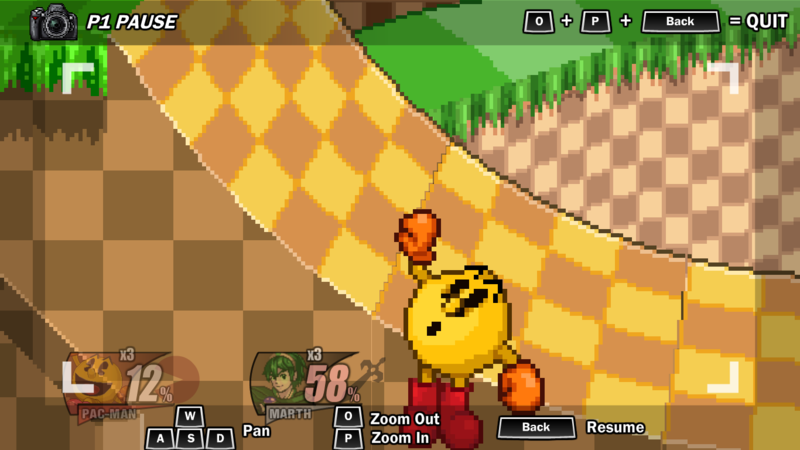 If Megaman's side-b hits a Pacman fruit, it will stick to the fruit. When the fruit disappears, the crash bomber remains where the fruit was last until it explodes. EDIT: Same thing with a fire hydrant. Hueco Mundo's left slope doesn't interact properly with rolls going leftward. -Turns out Hammer Bro DOES work, but only sometimes. File comment: I placed this Unira on a moving platform that went down and it just... stayed there. This happened twice, but I only got the one screenshot. Also I'm just now realizing the placement of the Unira next to the statue looks like it has light-blue pit hair now. There's a test word at the bottom of the Silhoutte Characters. "W-what do you want?! Baka!" - Starts your character on the opposite side of the stage after entering the game. - When using a Gamecube controller (with a Mayflash adapter) for a short time, the shield will become permanently stuck on during a match, even when quitting that match and opening a new one. The only way to stop the shield from always remaining on is to exit and restart the game (this is a big problem right now and needs to be addressed quickly). - In Controls, after setting up controls for a Gamecube controller (Mayflash adapter), the only way to get the controls to start working is to either go to a different controller slot and return to the one you set up, or reopen the game. - While in fullscreen mode, after pressing ESC during key binding to cancel it, it cancels the binding but also shrinks the screen to windowed mode. - After playing SSF2 using a Gamecube controller with Mayflash adapter for 15 min or so, the monitor will fall asleep. The computer doesn't seem to recognize that it's active while playing SSF2 when using a Gamecube controller. - After closing the game, upon restarting it the Tap Jump option in the Controls returns back to "On" even if you turned it off previously. - The pause screen while in game gives you the keyboard inputs for camera controls/quitting even when using a controller configuration (this can be hard to know how to quit a match). - Not a bug or anything, but while in champ select when using a controller, the hand cursor doesn't reach all the way to the bottom of the screen, where as it goes right off the screen at the top. - Just a small thing, but it'd be nice if there was a Quit button while in the main menu to exit the game, instead of having to press escape to make it windowed mode, and closing the window. That's it for now. Thanks so much for Beta. It is awesome! Just hope that issue with shields when using a Gamecube controller with Mayflash gets fixed real soon especially. Now on this one you can barely see, but I actually jump before the PK Thunder. I haven't been able to get my PK Thunder stuck while using a grounded PK Thunder. I don't have a gif of it, but I once got when my PK Thunder hit one of Peach's turnips. I also "think" I might have gotten stuck when it collided with another character's aerial attack during that early phase of PK Thunder.